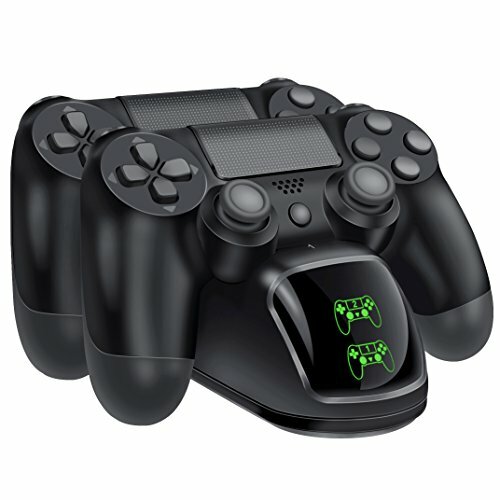 Features dual wireless Controller charger for PS4/PS4 Slim/PS4 Pro Controller with the charging dock, users will be able to charge up to two dual-shock 4 wireless Controllers at once without having to connect them to the PS4 system with 2 built-in micro USB adaptor ports the charge dock can simultaneously charge connecting the cable will allow charging while the Controller still being used will not charge the Controller with over 70% power to protect the battery of the Controller the charge dock plugs directly into the Wall, leaving the USB ports on the for Sony's PS4 open and the Console tangle free for Sony PS4 USB charger station provides an easy and quick way to charge and store your for PS4 Controllers specifications LED indicator: red - charging LED indicator: blue - fully charged built-in protector chip: never over charged your PS4 Controller even charge it for overnight fully charge time: about 30 minutes input voltage: DC 5V 1000mA output voltage: DC 500mA for each Controller charge slot cable length: about 3.3Ft(1 meters) package included: 1 x Controller charging station 1 x USB cable note: the PS4 Controllers in the pictures are not included in the package. 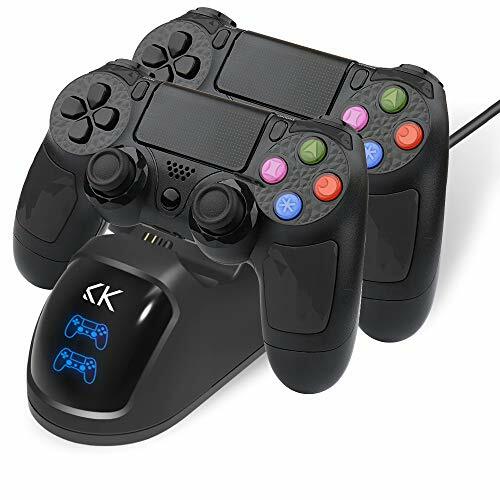 IHK brand Playstation 4 controller charger is light, convenient and fast charging. Though only a tiny body, it can be charged via connect with the PS4 console or the computer usb interface. dual controller charge dock's base and fuselage could be detached. 4.Ready for charging your controller. The PS4 controllers in the pictures are not included in the package. Compatible with Sony PlayStation 4 PS4 / PS4 Pro / PS4 Slim Controller. Charge dual PS4 / PS4 Slim / PS4 Pro Controllers simultaneously. Save your time and get more fun. :Chip protection,Allow you charge ps4 controller without any worry even over night. Chip protector: over-charging-voltage-current and short-circuit protection. Built-in 4 Micro USB Adapter Ports Insert micro USB charging adapter ports into the PS4 controller and no need to get off while using, which can protect your controllers better and extend the life of your controller. 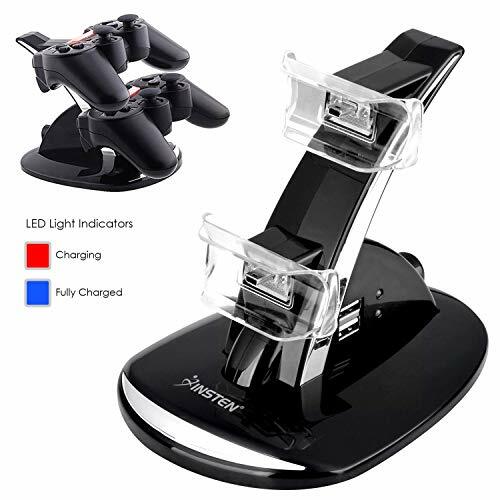 Safe & Fast Charging PS4 controller station will be full charged on 2.5 hours.The PS4 charger could fast charge dual controller at the same time.No need to remove the battery, it save you more time to play. This is a good gifts. LED Indicator Light PS4 controller charger built in LED indicator for charging status. Charging- Red Light; Fully Charged/Standby- Green Light.To let the user know that charging is complete. Sleek & Compact Design PS4 remote charger is easy to controllers into, very stable and keep connection well. Wireless ps4 charger is very small and doesn't take up much room, ideal for saving your place to store your controllers in the charger when you're not playing. 36 Years Warranty Dinofire supports 3-year warranty and life-time technical support. 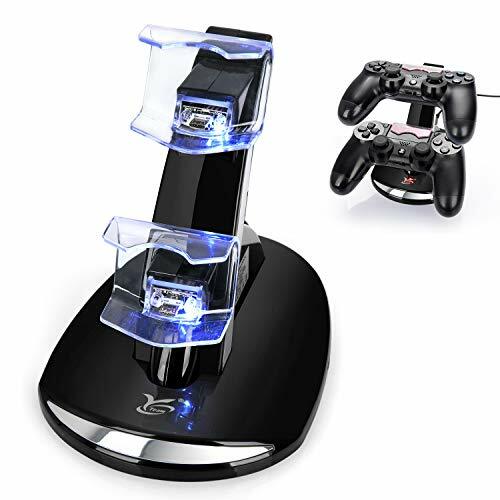 If you have any question about ps4 controller dock, you can contact with us, we will do our best to make you 100% satisfied for after-sale service. 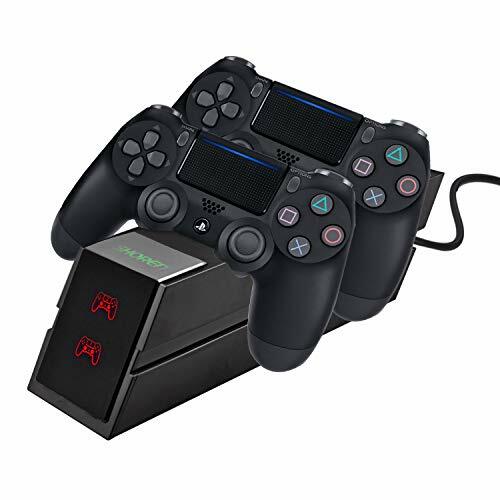 The PlayStation 4 Dual Controller Charge Station by Sliq Gaming is the latest addition to Sliq's product line . Always designed with performance and quality in mind with a Sliq touch to it. Another great additional feature is the Auto Standby feature. Once the controllers are fully charged, they will automatically switch off to prevent overcharging preserving the overall lifespan of your controller! ORGANIZED & TIDY - No need to have wires stretched across your room anymore - our charging station allows you to charge 2 controllers at a time in one area! OVERCHARGE PROTECTION - Helps preserve your batteries. Our charging station has overcharge protection, meaning that once your controller is ready, it completely stops charging. No more overcharging means your controller's last longer! ULTRA COMPATABILITY - Works with all models of controllers. Whether you're using the first generation of PS4 controllers or the latest, our charging station will work just the same! WE'VE GOT YOU COVERED - All Sliq Gaming products come with a 1-Year Replacement Warranty. Register your product to receive an additional 6 months of coverage! We've got you covered if anything goes wrong. We are a USA based company. Built-in Micro USB Micro adapter ports - allows you to securely store and charge up two controllers simultaneously without having to connect them to the system. Fuly charge can be completed within 2.5 hours when charging one controller. 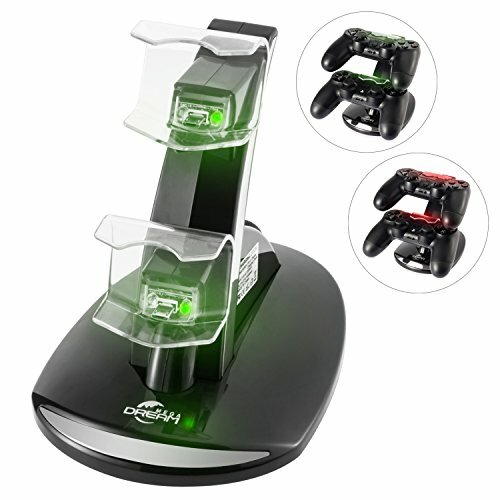 Fuly charge to two controllers simultaneously within 3 hours, It provides an easy and quick way to charge and store your controllers securely. Save place & safe - specially designed for saving the place & the built-in battery of the controller with a Protector chip begins to charge when the power is below 70%, If the controller is interrupted in charging process, then put it for charging again, and if its power is over 70% but below 100%, the charging will stop. In this power status, The using time Will be shorter than if it was otherwise fully charged. Built in micro USB adapter ports, securely store and charge up 2 PS4 controllers simultaneously. Fully Charge within 2-4 hours. Chip protection,Allow you charge ps4 controller without any worry even over night. 1.Any concerns or questions,Please feel free to contact us,Our services is stand by 7x24 hours. Just click ask questions and send email,We would help you now! 2.The PS4 controllers in the pictures are not included in the package. Fast Charging--The ps4 controller charger could fast charge dual controller at the same time.Two hours full charge to save you more time. Chip Protection--Safe and reliable to charge ps4 / ps4 pro / ps4 slim controller.Comes with over-charging,over-voltage, short-circuit protection. Led Indicator--Stylish led indicator would indicate the charging status clearly,Red for charging,Green for full charge or standby. Easy to power--Built-in USB micro ports allows you to securely charge up two PS4 controllers simultaneously without connect them to the PS4. 2. Attractive Design Could be taken anywhere thanks to the charging dock's detachable design: dual controller charge dock's base and fuselage could be detached. 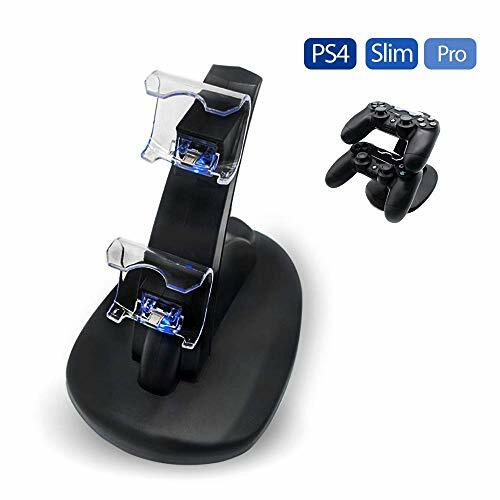 SAFE AND FAST CHARGING STATION - For SONY PS4 PS4slim PS4pro Controller Charger Dual USB Charging Charger Docking Stand for PlayStation 4 PS4 Controller. EXCELLENT DESIGN --Over-Charging/Over-Heated/Over-Current/Over-Voltage/Short-Circuit/Over-Discharger Protection. How to Provide You With Safe and Durable Ps4 Charger is Our Eternal Pursuit. 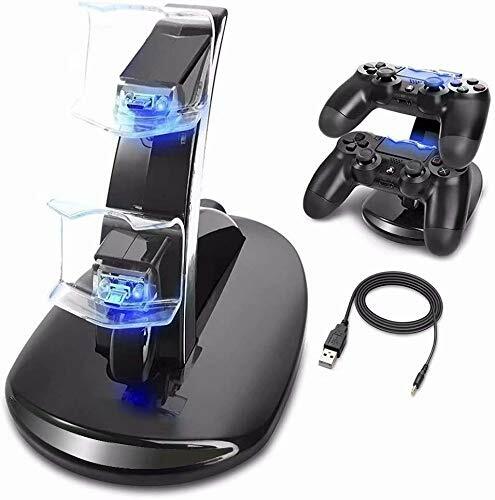 [FAST DUALSHOCK 4 PS4 CONTROLLER CHARGING STATION] Fosmon's dual PS4 controller charging station is a great option for fully charging your Dualshock 4 controllers in under 3 hours. [LED CHARGING INDICATOR] This PS4 controller charging station has built-in LED indicators to show the current status of your controller. Red means the controller is charging. Green shows the charging dock is idle and the controller is fully charged. 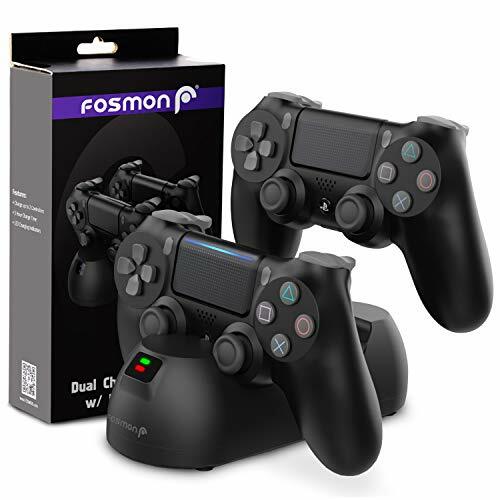 [EFFICIENT AND SLEEK DESIGN] Fosmon's dual PS4 controller charging station adds a great look to your gaming setup while efficiently charging your Dualshock 4 Controllers. We are committed to provide you with the best quality products and most satisfactory services. In order to provide you with the best shopping experience, we provide 12 months of quality assurance and 24-hour customer service. This dual charger provides a quick and easy way to charge the PS4 / PS4 Pro / PS4 Slim Controller. Your kid / BF / lover who likes PS4 game will be surprised when he receives the charger. Maybe he will cheer for this: "I like this gift so much, you entered my heart." Power up two PS4 controllers simultaneously and enjoy the included Energizer PS4 recharge packs for hours of non-stop gaming. Simply lift your controller from the glowing controller ports that light up orange to indicate charging and blue to indicate a full charge and you're good to go. With a low profile design to match your PS4 system, store and charge your controllers with ease. Grab a charged controller and join in on the fun. Clever design you don t want your charging system to stick out, so we ve designed it to match your PS4 console! If both of your controllers were completely dead,don't worry! -Full charge to two controllers simultaneously within 6-8 hours. 4. Ready for charging your controller. Saving Place: You can hook them up to a usb wall charger, or directly to the PS4,taking up a whole lot of space! 100% MONEY BACK GUARANTEE: If you are not satisfied after experiencing the product, Loovbee will refund you 100% of what you paid. we are guaranteed to be highly responsive ASAP! Charge one or two controllers at the same time. Excellent chip design protect the controllers from Over-Charging, Short-Circuiting, and more. Easily attach the PS4 Controller to the PS4 Charging Dock. Props the controllers upright for convennient use while charging. LED indicator lights up and stays in blue once powered on. Detachable stand base for easy storage and transport. power of technology to make life better, easier and fuller. The PS4 controllers shown in the pictures are not included. If you have any questions, Pls feel free to contact us, we will try our best to help you. Unique and Professional Design- Playstation 4 Charging Station with Dual micro USB port, only Compatible for the Sony PS4/ PS4 Slim/ PS4 pro wireless game controller kit (wall adapter is not included). Ultimate Safety -Excellent chip design protect the controllers from Over-Charging, Short-Circuiting, and more. Anti-slip & Compact Design - This dual charger provides an easy and quick way to charge and store your PS4 / PS4 Pro / PS4 Slim Controller. Simple To Use - Easily attach the PS4 Controller to the PS4 Charging Dock. Package content - The PS4 Controller Charger comes with a charging dock and an USB cable. 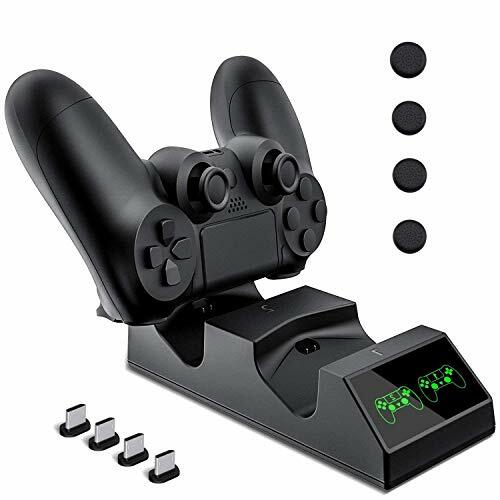 Our playstation 4 controller charger station is made of High Quantity materials and we are confident with our product. Whether it is the price or quality can be assured to buy, Providing 1-Year warranty policy and 3-Year support. LED lights clearly indicate in front of screen when charging is complete; green light States The PS4 controller has been charged completed, Red light States when charging. Suitable For All Playstation 4 Controllers --Our PS4 controller charger is compatible with Playstation 4 / PS4 / PS4 Pro / PS4 Slim controller. 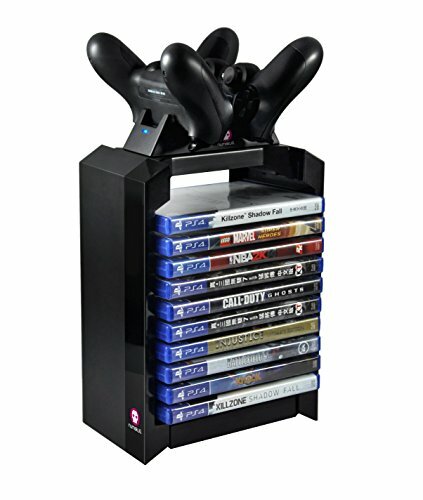 Saving Space Design --There are 2 stand on this ps4 charging station, it can be storing 2 controllers when not in use and charge simultaneously. Fast Charging -- Charging one controllers within just 2.5 hours and two for 3 hours, no need to wait more time and enjoy game with your friends. Power through the USB port from either the PS4 console, PC or wall power source (Wall Adapter is not included). LED Indicator Light --The light would be red when controllers are charging and green when they are fully charged. Safety Technology --Over-charge protection, you don't need to worry Over-Charging/Over-Heated/Over-Current/Over-Voltage/Short-Circuit/Over-Discharger. Provide you security charging even overnight. 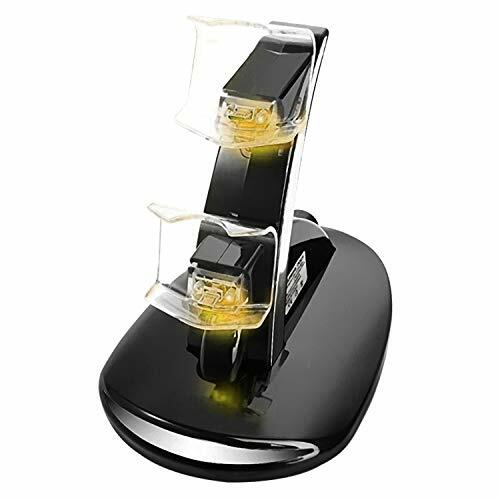 This ps4 charging base supports the loading of two PS4 controls simultaneously, taking approximately 3 hours. With the built-in charging protection clip, your control will not be overcharged even if it's charged all night. Compatible with the Sony PlayStation 4 PS4 / PS4 Pro / PS4 Slim controls. Load two PS4 / PS4 Slim / PS4 Pro controls simultaneously, saving time. Circuit protection which allows you to charge the ps4 controller without worrying, even at night. Circuit protection against overload-voltage-current and protection against short circuits. 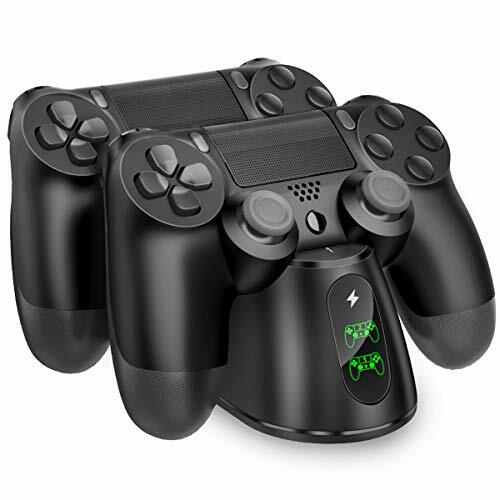 2-hour Fast PS4 wireless charger double Dual shock 4 PS4/ PS4 Slim/ PS4 Pro controllers simultaneously. No need to wait more time when charge two PS4 controllers; Save your time and get more fun. Just plug and charge, it is ready for charging your controllers. With provided 31-inch usb charging cable, power through the usb port from either the PS4 console, pc or wall power souce. It has a very nice looking indicator on the front that shows the status of the charging for each controller. If it's green it means fully charged and red means still charging. This PS4 charging station design 2 built-in micro USB adapter ports, Fully charge can be finished within 2.5 hours for one controller. 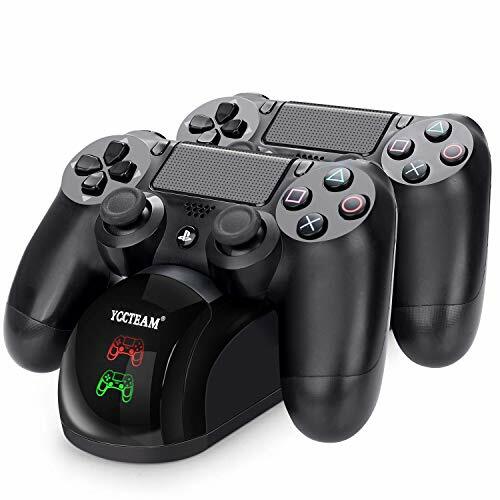 Fully charged for two controllers simultaneously within 3 hours, which can provide an easy and quick way to charging and store your PS4 controllers securely. Unique Crackle lighting Design Our PS4 Controller Charger is with unique crackle pattern, eye-protection light will be emitting from the natural crackle after connecting usb cable, red and blue alternate while charging up the controller, and then blue again when fully charged. 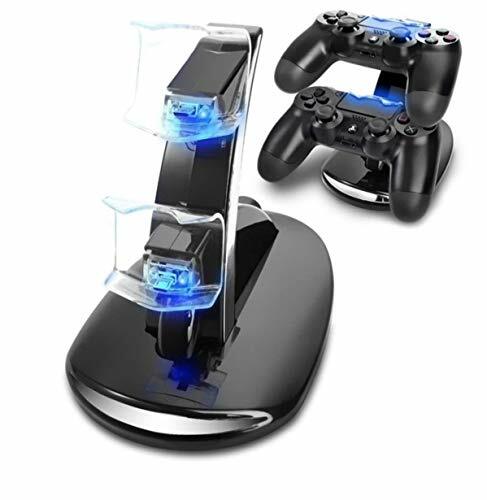 Multi-Protective The LED PS4 charging dock built-in smart current-limiting chip to protective your device from over-current, over-voltage, over-heating, short circuit, over charge or discharge. international voltage: AC 100-240V. 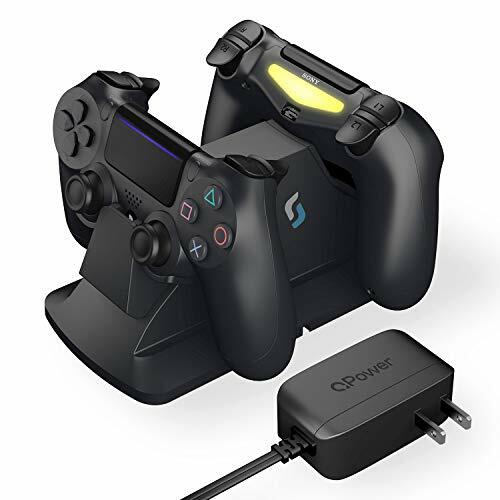 Safe & fast charging The LED PS4 charger with 2 built-in micro USB adapter ports, 2 Mini USB Port and an extra USB port , Allows you to securely charge up 2 PS4 controllers and 2 moves and your cell phone simultaneously. 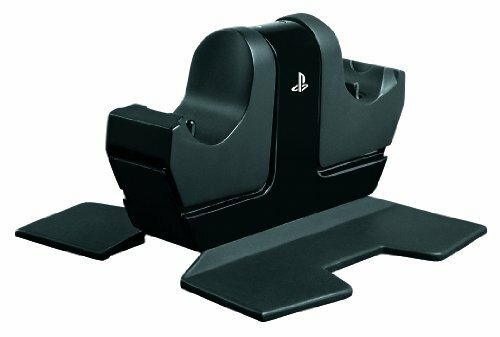 PS4 charging dock is compatible with PS4 / PS4 Pro / PS4 Slim controller and PS move. Smart IC Technology The wireless ps4 docking station charger will always outputs the optimal current for safe charging your device at maximum speed. otal output 2 Amp (1A/2A) can provide a smooth charge to your phone, game controller and other usb enabled devices. SATISFY SERVICE GUARANTEE We always support 360 days full refund or replace for any product issues, if anything wrong with our ps4 charger station, please don't hesitate to contact us. Due to the adapter that has high capacity, the load can be completed in 2 hours (a single controller). The full charge to two controllers simultaneously is 4 hours. Thanks to its design, it can be installed anywhere. In addition, thanks to its removable design, the body can easily be separated from the base, it can be transported to any place. Its design is compatible with the PS4 / PS4 Pro / PS4 Slim controls. Two controls can be charged at the same time, with an estimated time of 4 hours. The LED indicator light will remain red while the controller is charging, until the charge is complete, at which time it will turn blue. In this way you can easily know the status of the loading of your PS4 commands, just by looking at the color of the indicator. The controllers shown in the pictures are not included. 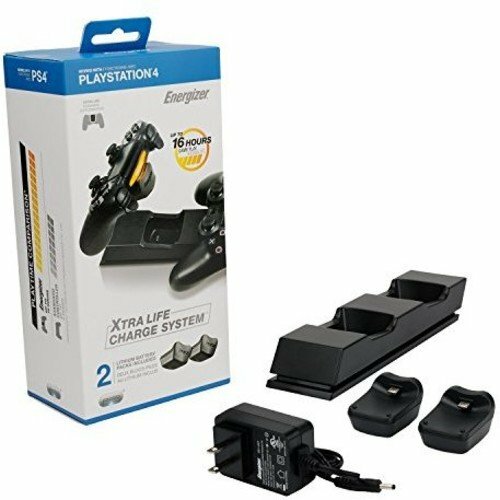 COMPACT & SAVE SPACE This dual charger allows you to easily and quickly load and store the control of your PS4 (Original, Pro and / or Slim). LED indicator The built-in LED indicator allows to know the status of the load. It will remain red when one of the controls is being charged, and blue when the charge is complete. FAST Charging Charging can be completed in 2 hours. The full charge to two controllers simultaneously can be 4 hours. The PS4 controllers in the pictures are not includede in the package. Warranty: We support our best service,high quality products and 12 months warranty. If you have any questions with our product,pls do not hesitate to contact us,we will try our best to help you and reply within 24hours. 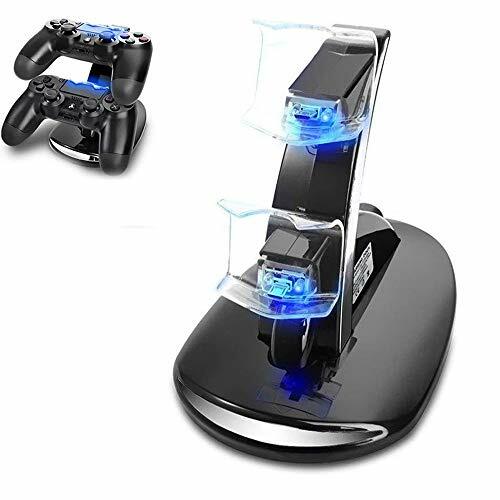 Our PS4 USB Charger Charging Dock is Unique Triangle USB controller charger allows you to securely store, charge up three Sony PS4 controllers and 1pcs VR handles simultaneously at the same time. LED Indicator: The top of the charging station is equipped with LED indicator light. It will automatically turn on when it is charged. It will be extinguished automatically when it is full, without any complicated operation. The Playstation 4 charger holder Built-in protector chip, never over charged your PS4 controllers even charge it for overnight. Rubberized feet ensure a non-slip and secure stand, matte surface reduces the susceptibility to scratches and marks. Very Easy to Use: No need to plug this into a wall outlet. 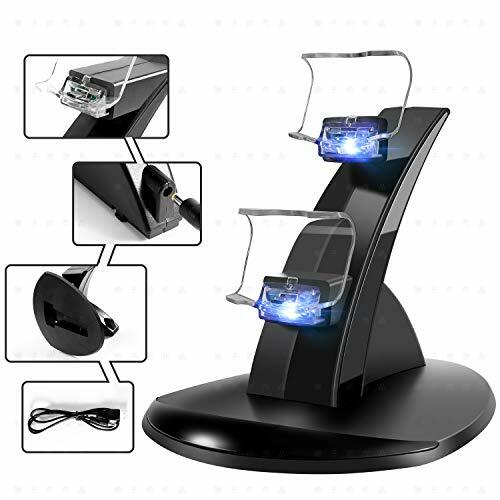 Just plug the controller into the charging station, then connect the charging station with 5V power supply, and the LED light indicates that it is charging. Package Includes: 1 x Dual Charge Station with Stand compatible with PS3 Controller, Black Compatibility: Sony PlayStation 3 / PlayStation 3 Slim Product Description: 1 x Dual Charge Station with Stand compatible with PS3 Controller, Black Compatible with: Sony PlayStation 3 Dual Charge Station designed for charging the PS3 controllers Power through the USB port from PS3 console. Up to two controllers can be charged simultaneously. 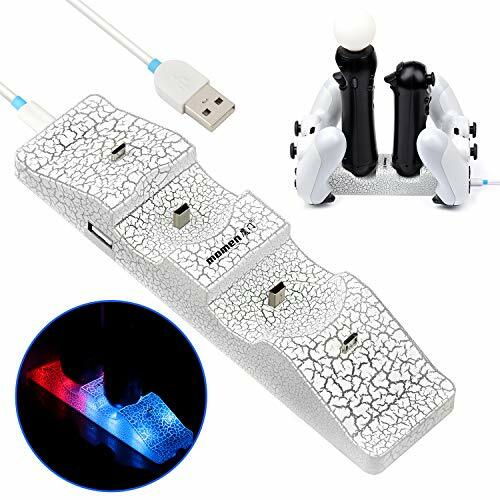 With two extra USB ports, allow you to charge two more controllers(total 4) with USB to mini 5 Pin cables(USB cable for charging extra controllers not included) Full charge can be completed within two hours when charging one single controller. Distinct dual colored LED light indicator showing charge status. Charging: Red/ Fully Charged: Blue Trendy and exquisite yet convenient and secure design. 5V output with 200 to 400 mAMP. 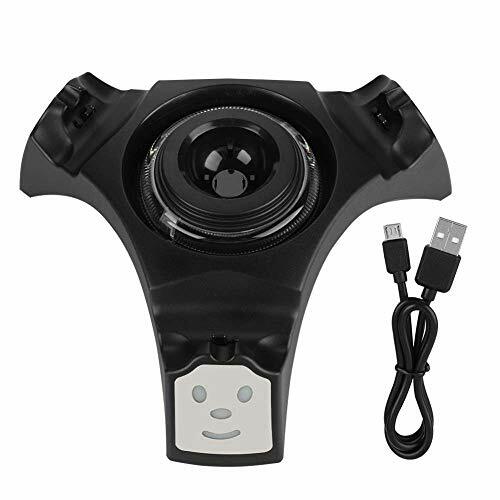 Unit Size:153 x 113 x 123mm Color:Black 1.This controller charging dock can only charge the original/official PS3 controller 2.Please charge via the USB port of your PS3 console. Accessory Only Note: To charge the controllers, customers have to turn on PS3 instead of leaving PS3 in off/standby mode Note: Colored LED light indicator will turn on only when the controller is placed on the charger station WARNING: This product can expose you to chemicals including DEHP, which is known to the State of California to cause cancer and birth defects or other reproductive harm. For more information go to P65Warnings.ca.gov. Product names are trademark of listed manufacturer or other owners, and are not trademarks of Insten Fulfillment. The manufacturer does not necessarily endorse use of these products. Dual Charge Station designed for charging the PS3 controllers. Power through the USB port from PS3 console. Up to two controllers can be charged simultaneously. With two extra USB ports, allow you to charge two more controllers(total 4) with USB to mini 5 Pin cables(USB cable for charging extra controllers not included). Full charge can be completed within two hours when charging one single controller. Distinct dual colored LED light indicator showing charge status. Charging: Red/ Fully Charged: BlueTrendy and exquisite yet convenient and secure design. 5V output with 200 to 400 mAMP. Unit Size:153 x 113 x 123mm. Color:Black. 1. 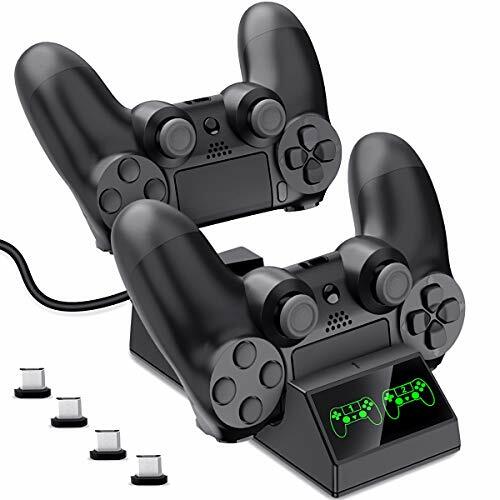 This controller charging dock can only charge the original/official PS3 controller. 2. Please charge via the USB port of your PS3 console. Note: To charge the controllers, customers have to turn on PS3 instead of leaving PS3 in off/standby modeNote: Colored LED light indicator will turn on only when the controller is placed on the charger station. LED Charging Indicator: Before insert PS4 Controller, the Light is Blue,Red LED lights clearly indicate in front of screen when charging; Blue light States after the PS4 controller has been charged completed. 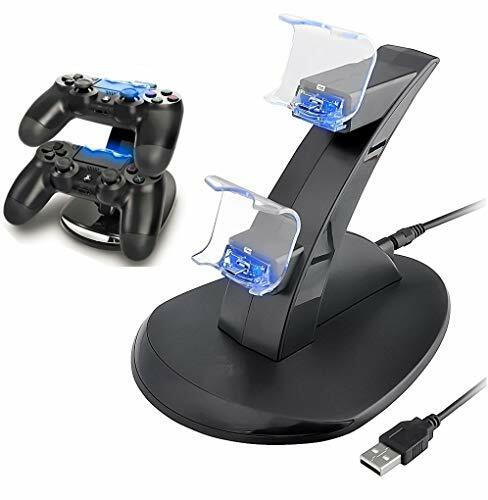 Fast PS4 Charging Station: 2-hour Fast charge for one Dual shock 4 PS4/ PS4 Slim/ PS4 Pro controller. 4 hours full charged when charge two PS4 controllers. 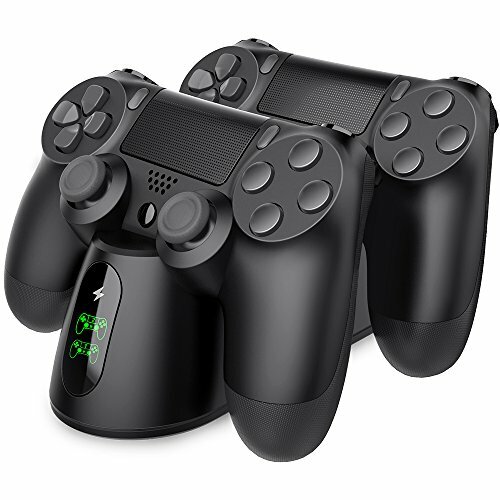 Compact & Save Space: Built-in two EXT adapter ports,space saving design for dock, store & charge 2 x dualshock4 wireless controllers,allows you to securely store and charge up two PS4 controllers simultaneously.There is a anti-slip strip on the bottom,which protect your charging dock from shifting and falling. 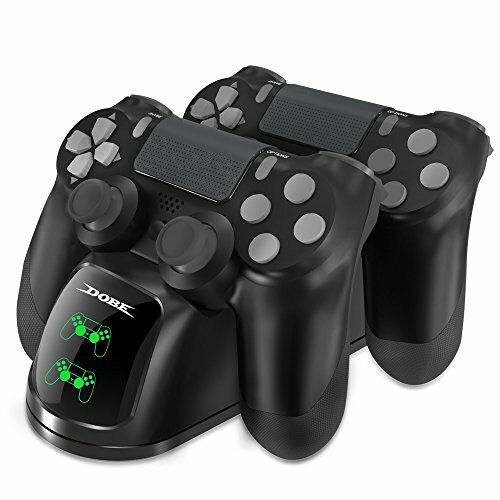 SECURE DESIGN: This ps4 controller charger have designed a protector chip, includes short-circuit protection, over-temperature protection and over-voltage protection, Specially safe designed for the built-in PS4 controller battery with a protective function begins to charge when the power is below 70%,which means the using-time will be shorter than if it was otherwise fully charged.